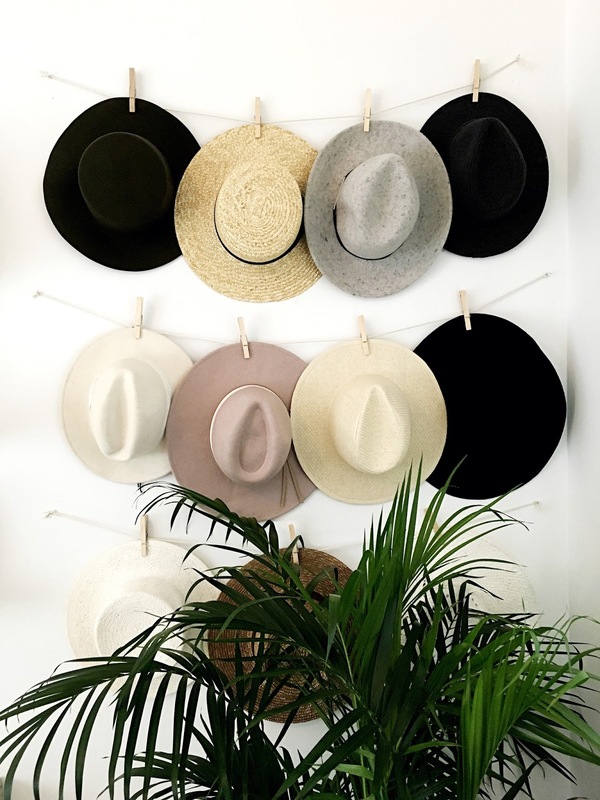 Hat rack ideas – There are so many kinds of hats to the extent that hat collectors should rack their brain to think about some, if not one, hat rack ideas. So many kinds of hats, that person probably have worn them but they don’t know what kind of hat they wore. Some of the hats often worn by people are ascot caps, similar to flat caps but they’re hard and have rounded shape; baseball caps, soft light cotton caps with a rounded crown and a stiff bill that projects frontward; and beanies, brimless caps with or without a visor. Unfortunately, it is rather hard to organize some of the hats which have a certain shape that cannot and should not be folded, isn’t it? It may not be a problem with one or two hats. You don’t need a lot of space to store them. A small drawer or a small space inside a cupboard will be enough, and that’s that. Nonetheless, it will be a different story if you are a hat lover and have a bunch of collections. 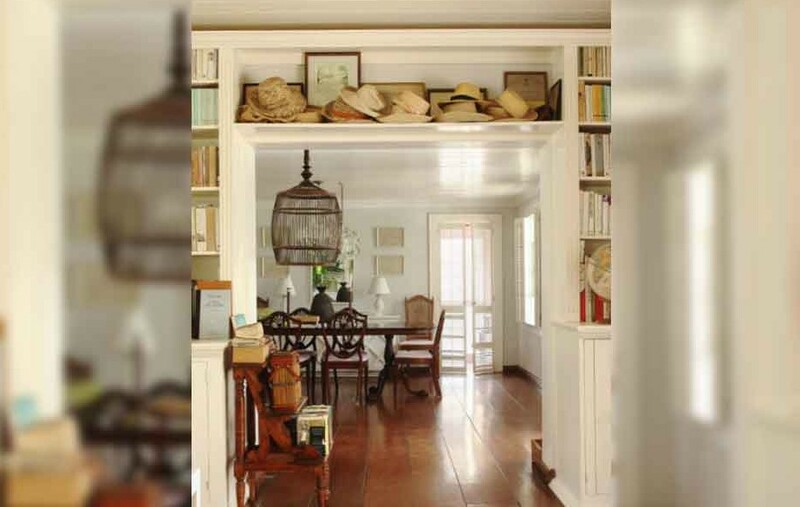 A big problem may occur if you don’t have a big space readily prepared. Where to put your collection is one problem, and where to put your just used hats is another. Well, by the way, where do you put your travelling hats? At the end of a long and hard day, we understand if you want to directly take a rest right after you get home, don’t want to care also about your travelling hats or other accessories like scarves, socks, and bags. Throwing them wherever near is probably your best bet. Instead of throwing them carelessly and add more problem of untidiness for yourself the next day, you should consider having hat racks. Appropriate racks for your hats will prevent your collection from getting wrinkled or damaged and dusty. That is what will be discussed in this article today. 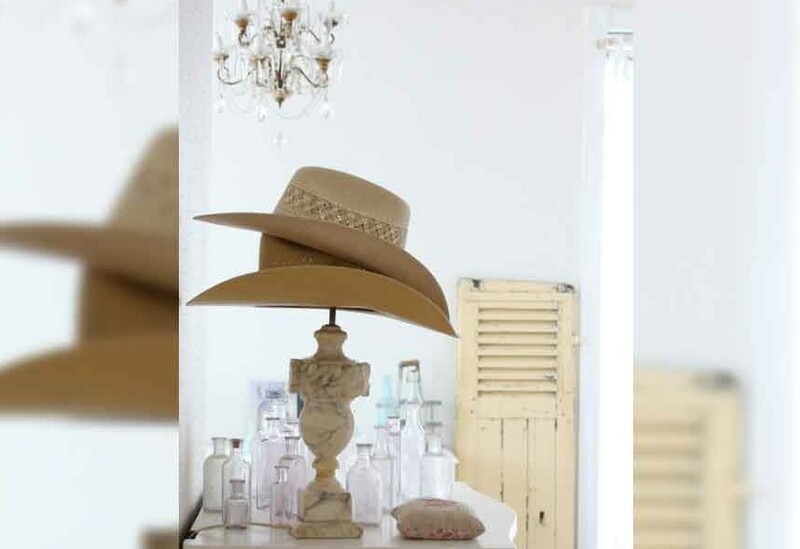 Some clever ideas of hat racks will be presented before your eyes to give you references to hopefully help you in managing your hat collections. Several of which will be given along with the information of where to buy them online if they are available for purchase. The ideas listed as follows. While you can build some of these hat racks, you can buy some others which are available for purchase both in online and offline stores. Like the one we see in the picture, for example. 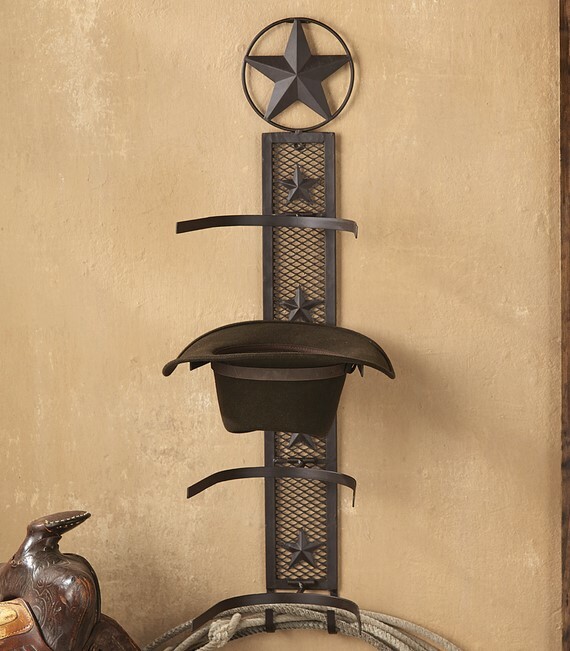 The Lone Star Western Décor sells this hat rack for USD39,95. Some classic western stars are mounted on a metal mesh which gives away the description of a cowboy. In the said online store, this item gets five stars out of five for the rating. Several of the reasons why are due to the facts that it needs no setup and large enough to hold wide brim western hats. From its shape, you see that it is meant to be hung over the door. But some user gives a review precisely about it. 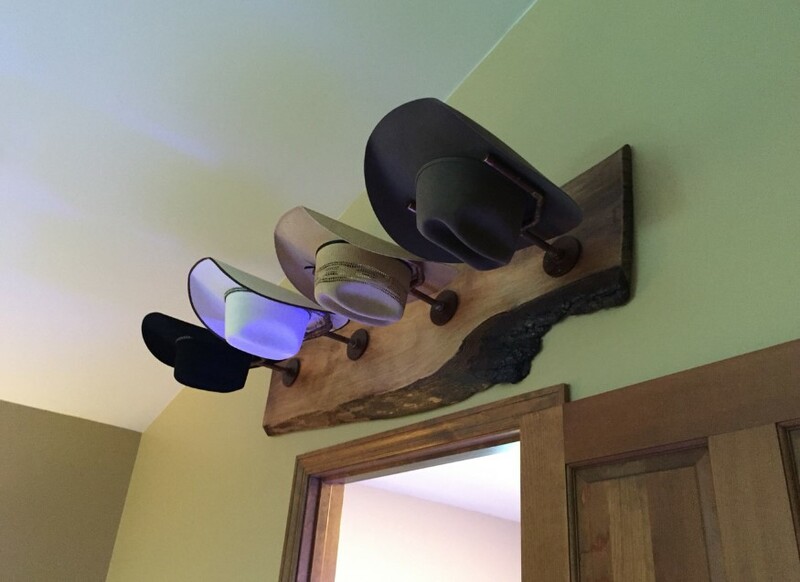 It was said that hanging this cowboy hat rack over the door is a little tricky because when the door is opened or closed to fast, the hats will fall off. The best bet will be to mount this item to a wall. You might go with one of the most typical 2 sided cover screen or a cost-free standup presentation shelf or probably a three pocket pawn show shelf. Also the one-side weighted tower hat shelfs are praiseworthy. You might likewise buy a tailored hat rack online, if you don’t discover an optimal hat rack of your selection. 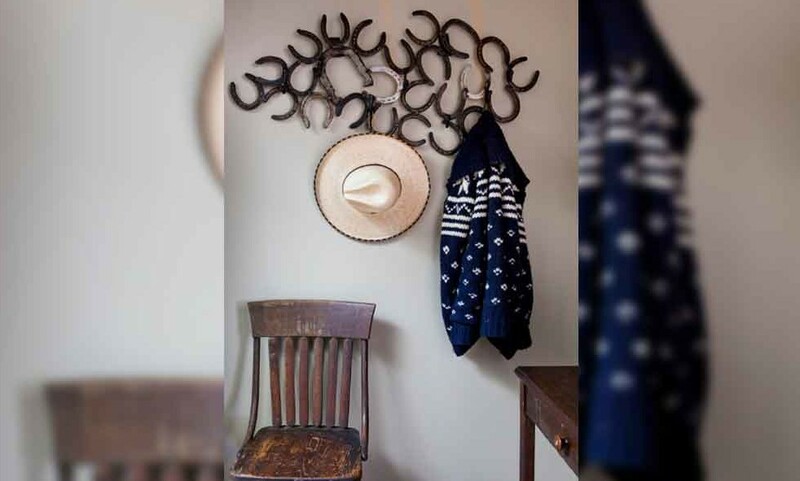 Now, this hat rack can be both homemade and bought. It usually needs 3 to 4 days to make one. Otherwise, if you want to save the trouble, just search it online and buy it for only USD70. Amazon has it available for purchase. It will look perfectly well in your hallway, entryway, bedroom, laundry room, or even your bathroom. The fine material makes it no problem of getting water splashed. Also, it can be used to hang keys, coats, towels, or robes beside hats. It is ready to hang as this reclaimed wood hat rack is provided with two heavy-duty D-rings which are mounted already to the back. Because it is made with reclaimed wood, you will hardly find any two items that are identical with each other. And because it is made with reclaimed wood, you will find some scratches, dents, or nail holes. But that’s okay because the flaws are what give character to the hat rack. Certainly, everyone possesses some type of a baseball cap- usually having instead a collection of these. It is most necessary to save them suitably, particularly with such extensive collection of baseball caps. Order for the most ideal sized rack. Before you start shopping you must recognize the variety of caps you possess and also where as well as how you plan to save them. The unsafe heavy building working sites require protective head gears which will prevent any type of kind of damage to your head in instance of a crash. But where to place your safety headgears or construction hats after work, is a concern which possibly never cross your mind. Anyway, shelfs for safety equipments are gaining popularity due to the rise in security measures taken for the employees. A dinosaur will be a lovely theme for your boy’s room. You can make a dinosaur hat rack as an additional accessory, organizer, as well as a decoration. The good news is a total of less than USD25. With that some amount of money, you will need a set of dinosaur toys, poplar wood strips, screws, spray paint, band saw, and screw gun. Firstly, saw the poplar strips into sections and paint them in color your boy will like. Saw the dinosaurs and drill holes in the poplar strips. Attach the dinosaurs to the strips and you will get the final result after that. You can hang them inside the closet or on any wall in your boy’s room. Note that you can replace the dinosaurs with any toy set according to your child’s preference and his or her room’s decoration. As long as you have a place or space far away from getting seen by people, then you have your own hidden hat rack. 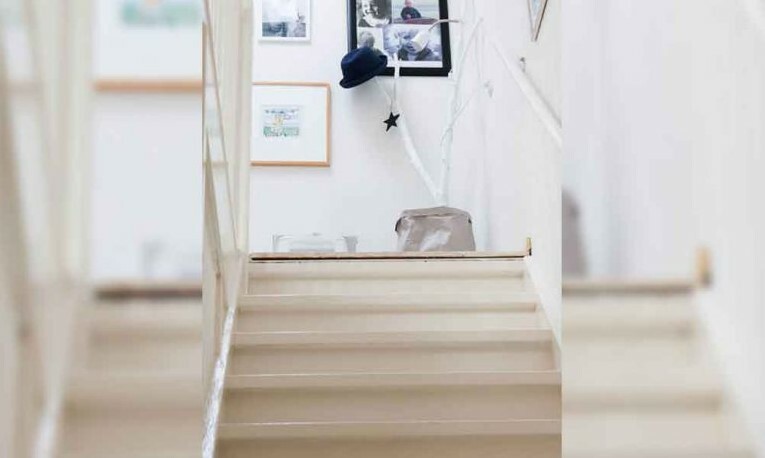 Seen in the picture how the hat collectors store their hats in some less use area within their house: an empty shelf above the entryway. But of course it could be anywhere inside your house; anywhere you think possible. With that, you don’t need to prepare some budget to make hat rack or even to buy one. Plus, you make use of something unthinkable into something valuable. And because it is on your way to get outside, it will ease your job to grab the hat you want to use. You know you’re creative when you think outside the box. Like placing your cowboy hats on the lampstand for example. 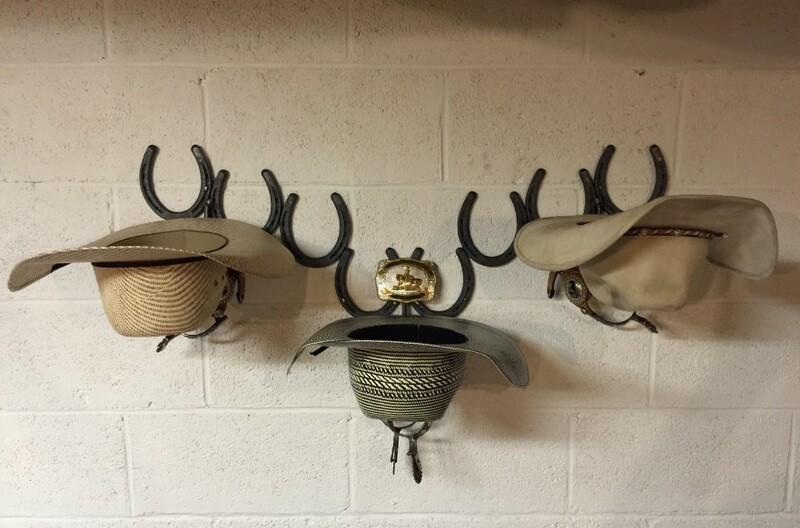 By doing this, you fulfill the need of your cowboy hats to be displayed. 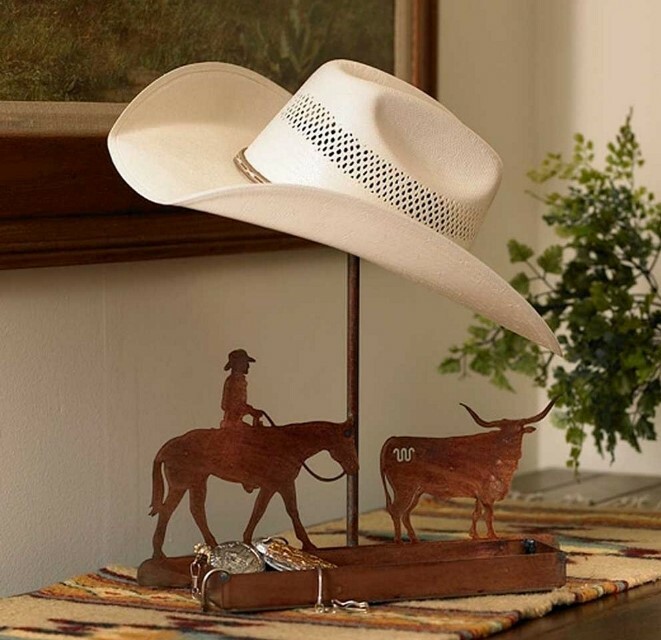 We know that a lamp is supposed to light its surround area, yet it looks more interesting when cowboy hats are placed where a light bulb should be. It leads you to have unintentional yet enjoyable room decoration. 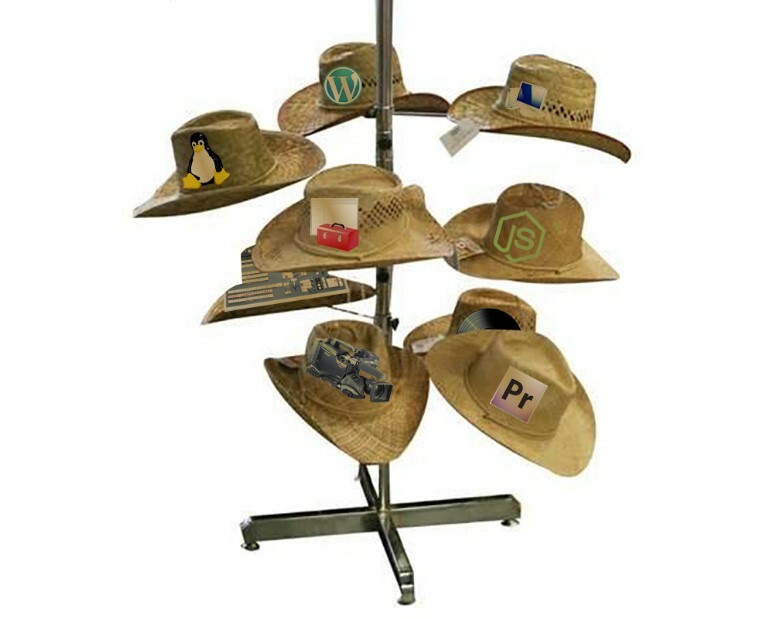 You don’t need steps of how to do it, or either spends more budgets on the way of having some creative cowboy hat. What should be done only replace the light bulb with some cowboy hats. How creative! There are many materials around us can be utilized for making a hat rack. For instance is pegboard. Pegboard can be utilized for making a hat shelf. Due to the fact that has many openings, you could use some nails on it. Finally, it can be used for hanging your hat. 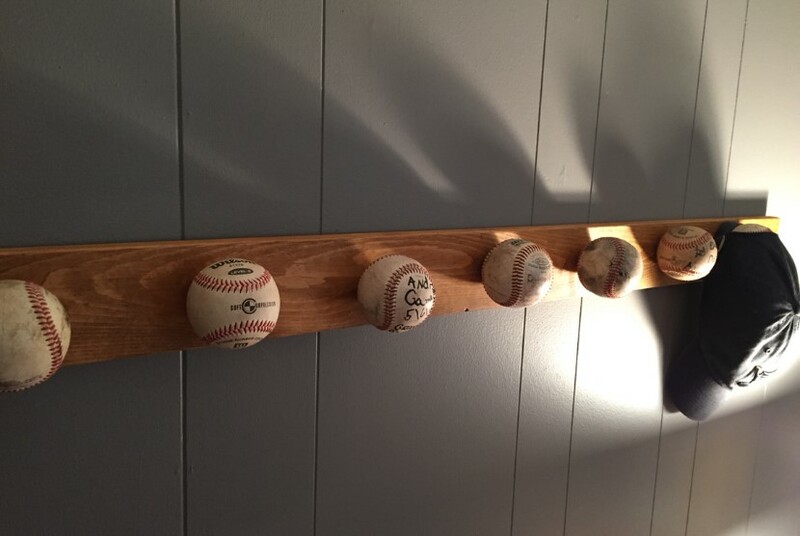 Not just pegboard hat shelf, you can create baseball bat fix hat. It is distinct idea you could attempt. 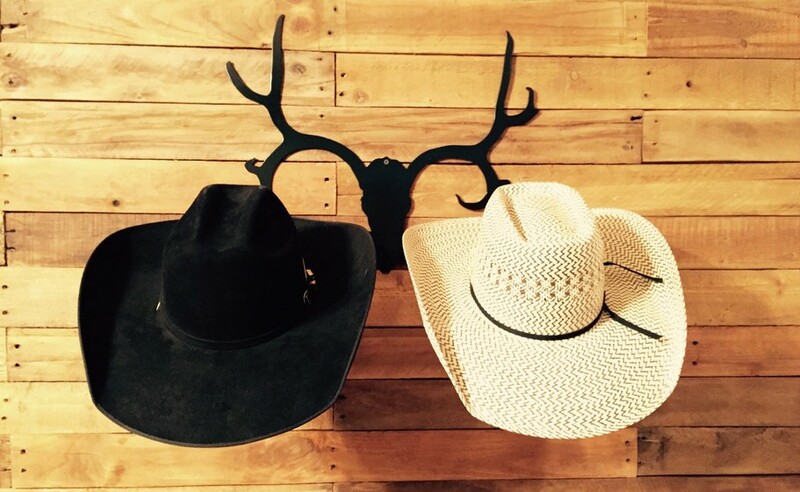 You just should use your creative thinking to develop one-of-a-kind hat rack for your hats. Try other hat rack concepts to develop ideal hat shelf for saving your hats. 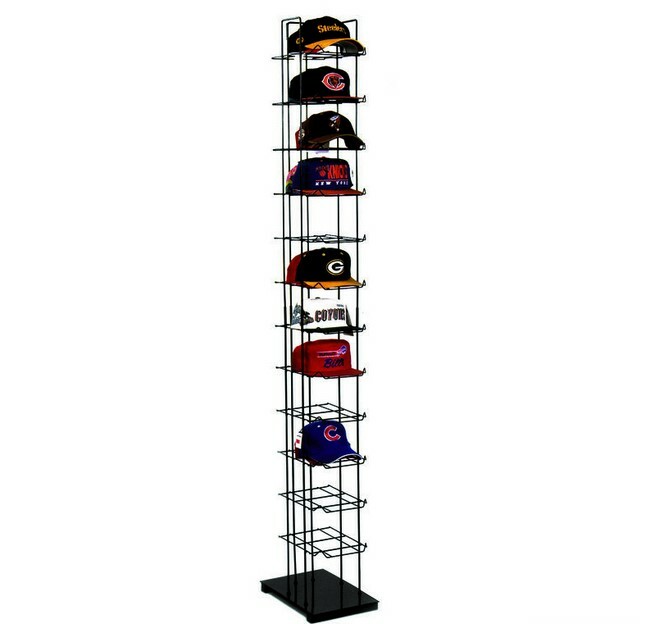 This is another cap rack that you can buy online. It has an contemporary style which displays your cap collections vertically on top of the floor. If you are a cap seller who owns a store, then this product is highly recommended for you. Why not? You can save your precious storage space due to its vertical design, and therefore display more caps so that your customers have more references to look at before deciding to buy one or more caps. The said cap rack also eases people to check the caps’ logos and brands they are looking for. While its base is designed with a certain weight to prevent this baseball cap tower from tipping and gives more stability. It is perfect to fulfill the priorities of displaying your caps and saving space. One rack can hold up to 144 caps and is available for purchase at Palay Display for USD104 each. 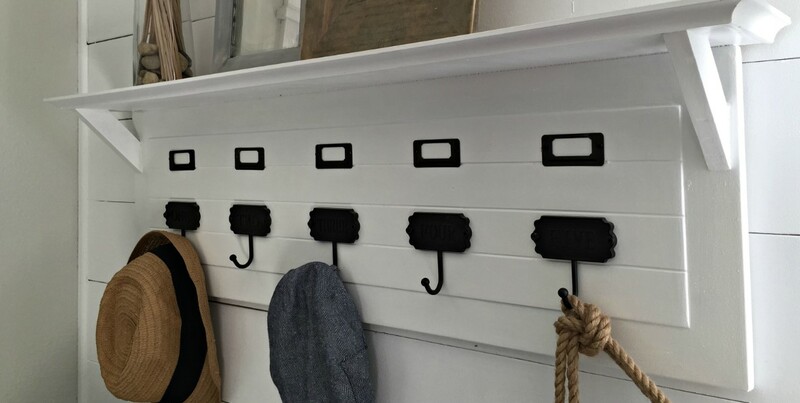 Pay some ranch a visit and save some horseshoes while you are there because you will need them to make this one of a kind from wall hat rack ideas. This is an artistic mean to repurpose some unused horseshoes. You only need to arrange them in irregular shape according to your liking and have them metal-worker soldered to securely stick them together. Mount it on the wall using nail and hammer and lastly put it near your entrance door. With this, you will save yourself a trouble of messy hats piling up in one corner of your house. And for additional advantage of having this rack, you can also keep some other things like keys and travelling accessories. So you can have all the small yet important stuff in one go, whenever you want to go outside. 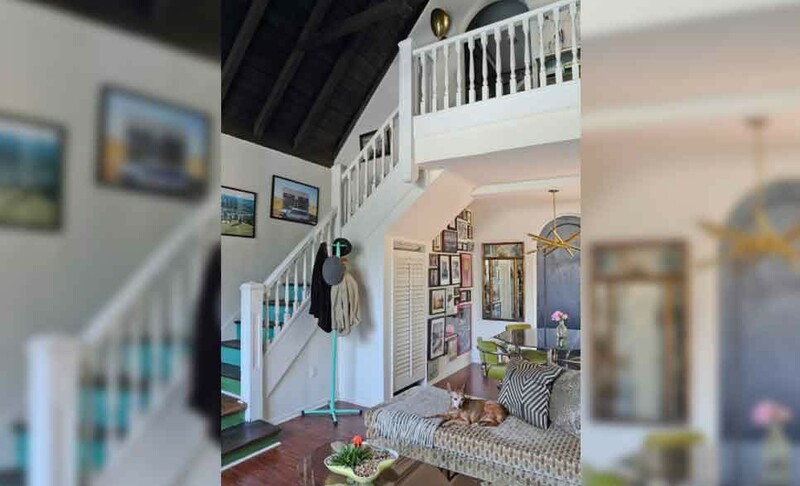 The picture shows you what a Los Angeles house looks like. But what catches your attention is not the house design, isn’t it? Rather, it is precisely a coat and hat rack that stands over there. Colored blue in the middle of the all-white room makes the hat rack outshine the whole room. You can have this wonderful 1960s teal rack stand from a flea market for cheap. And that’s that, you either need to make or to spend more money. What benefits you more is, that the rack is moveable. So, you can have it stood anywhere you see fit. When it involves installing this shelf, all that you would need are four screws, which are frequently included with the rack itself. Mounting this rack is not that hard and also you might constantly anticipate genuine comfort. The best thing is that you might choose the angle as well as the positioning where you want to install the shelf. Many home owners would certainly place the shelf near their cooking location to make sure that they can conveniently reach for the spices when the need develops. An additional fantastic feature of this kind of shelf is that the cupboards shield the spices from direct exposure to light. Everyone understands that light might shorten the shelf life of spices, so by being under the cupboard, the spices’ shelf life rises. 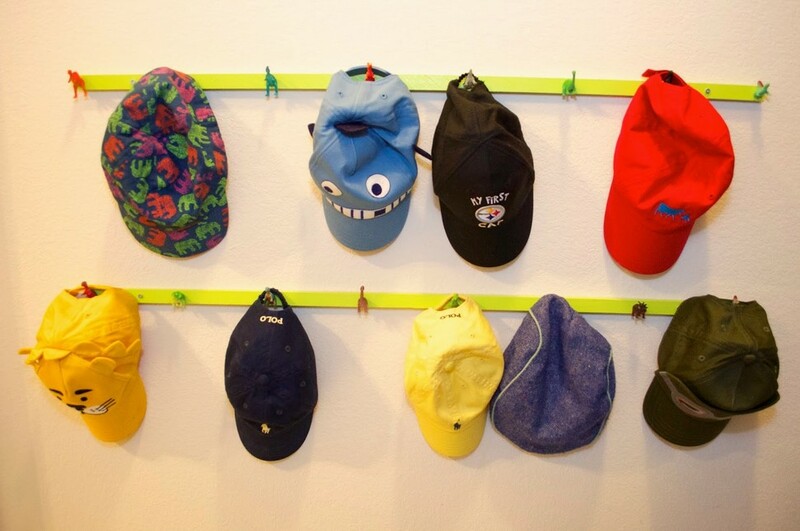 You can absolutely make this one hat rack ideas by yourself along with your family members. Make this as a family time project at the weekend and you’ll be satisfied with the result. From the said activity, you can get not only a hat rack but also a more bonding relationship with your kids additionally. 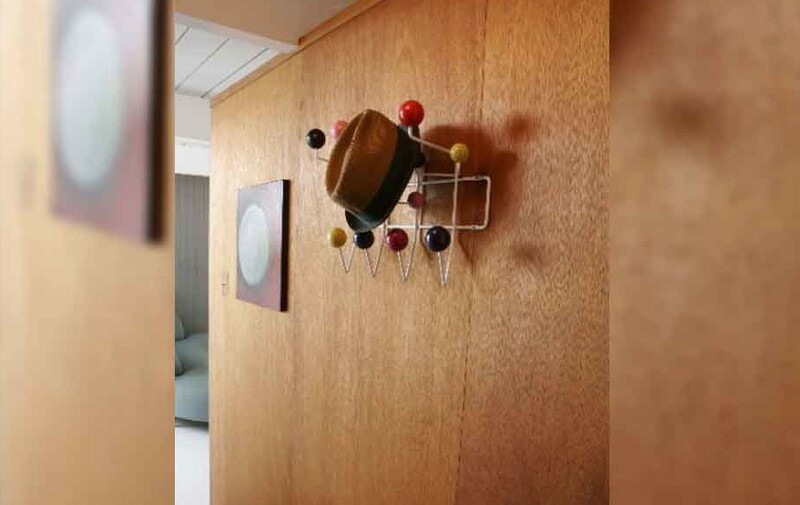 This homemade hat rack is easy to make using affordable materials and will lead to a unique outcome, too. 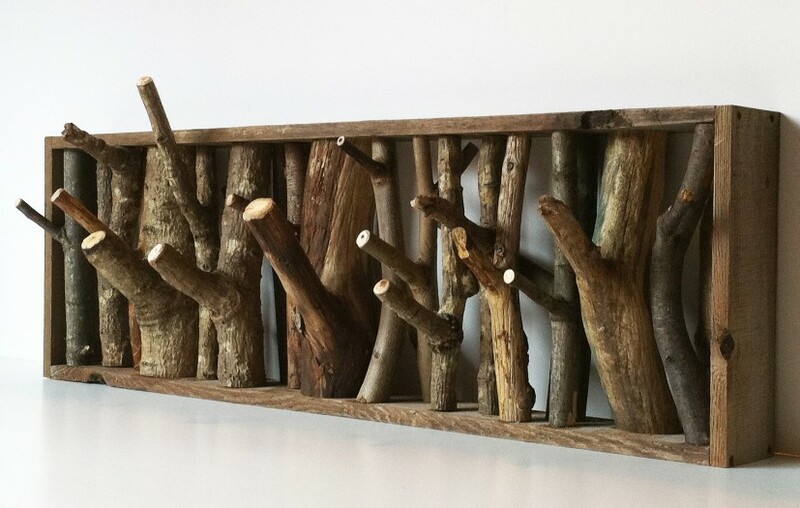 All you need to do is to prepare some planks to make the frame, twigs or small yet pretty sturdy small branches from your backyard or the park and something to stick the twigs securely inside the frame. Hot glue gun is recommended. 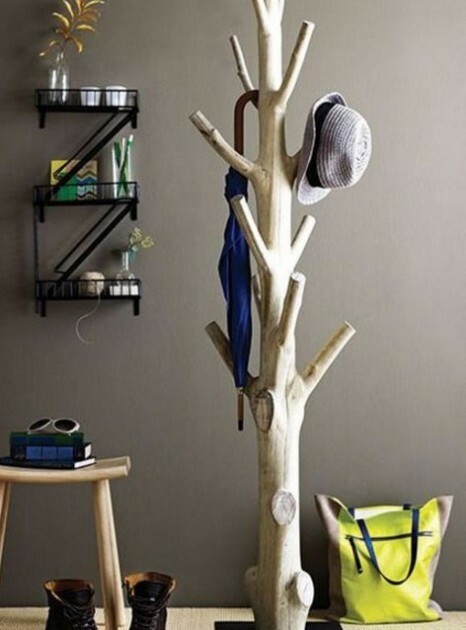 This kind of hat rack will bring a natural touch to your whole room. The interesting part is, besides hats, you can have some other things kept there also, such as keys, scarves, small bags, and jewelry. They say when something is limited by your idea, then the something is limitless. Well, we have to agree with that, why, by looking at this picture. The picture shows an outcome of having one of hat rack ideas executed. 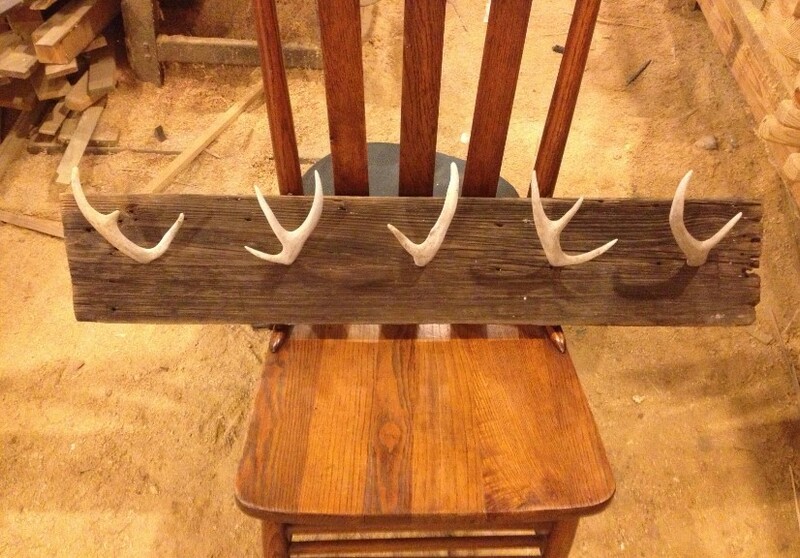 You can make a cool hat rack almost from any material as long as it has the function of hanging. In this case, the designer of this hat rack used the molecular model as hooks. If you can’t find a similar thing, you can use knobs which cheaper. You also need wooden dowels and woods pieces to hold still the molecular models when they were dried after being spray-painted. Don’t forget to consider the color selection. You can follow the picture or have your own color preferences. A white rack is required, too, to hang the molecular models. Drill holes in the models so that they fit the rack perfectly and securely. You know this is named ‘cool’ because, besides hats, you can also hang scarves, bags, and coats, and the hats have no problem with that; they’re cool. Either to make them by yourself or to buy them, hat racks are important, moreover to hat collectors. 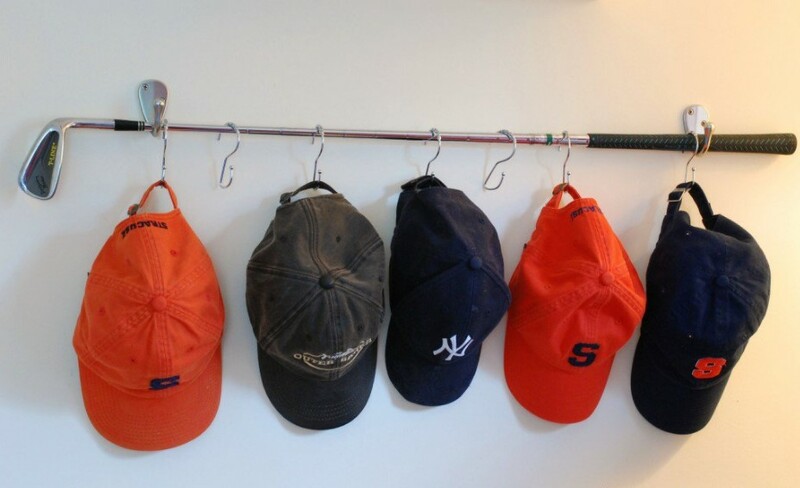 In case of saving money, homemade hat racks will be your best bet. Meanwhile, in case of saving time, buy them online will be the best solution. Whatever method you use to have hat racks, you still need references to do that, and that is what this article of hat rack ideas aims: to help you in deciding what kind of hat rack you should have and suit you the best.